Wow! I feel like I'm eavesdropping on a very expensive lecture. oh, I am! Great content! Keep up the hard work! Exploring the mindsets, motivation and methodologies behind success. Are you a Buffini Show Insider? What are you waiting for? Join today access exclusive content, goodies and bonus material. A Q&A session with Brian and Dermot Buffini talking all things business. Brian teaches how to succeed by having an "all in" attitude. Brian interviews Donald Miller, best-selling author and CEO of StoryBrand. Brian interviews Nick Vujicic, founder of Life Without Limbs. Brian interviews Grammy-nominated singer-songwriter John Ondrasik of Five for Fighting. Learn how good manners can improve your life and your business. Brian teaches you how to write a life-changing bucket list! You’ll learn how to turn your dreams into goals, how to create a powerful and inspiring bucket list, and so much more! Brian and Beverly Buffini answer questions about love, relationships, and family. Brian teaches how to be mentally tough; how your patterns reveal where you need to grow, the powerful how-to’s that will increase your mental toughness, and more! Brian Buffini interviews his personal trainer, Michael Stromsness. Dermot Buffini, CEO of Buffini & Company, interviews fitness and nutrition expert Angelo Poli. Tips and strategies for mastering the art of sales. More tips on giving your way to greatness with Brian Buffini and Joe Niego. In this season of giving, Brian Buffini and Joe Niego reveal six of the top 10 ways to become giver in all areas of your life. Brian Buffini tackles the most feared word in many households: Budget. He explains why you need one and offers tips to help you create one. Dr. Daniel Amen – renowned author, psychiatrist, brain-imaging researcher and founder of Amen Clinics – shares tips on improving brain health. What’s your golden ticket? Brian Buffini shares insight from a beloved Roald Dahl classic to help you develop a hopeful mindset and live the good life. Brian Buffini shares seven smart hacks for defeating the amortization schedule and paying off your mortgage much sooner. Best-selling author, Mitch Albom, shares details about his new book, “The Next Person You Meet in Heaven,” and why mistakes are a matter of perspective. Best-selling author Mel Robbins discusses the 5 second rule and shares how to apply it in your daily life. Want to be happier? 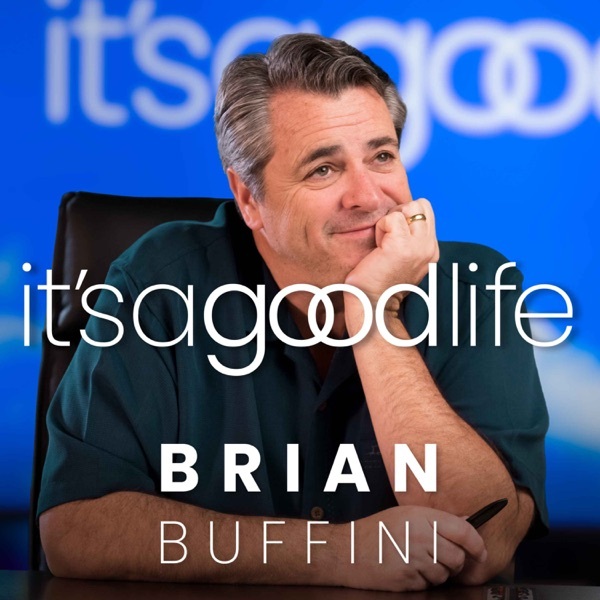 Brian Buffini shares how to banish the negativity of the status quo and live the good life. Find opportunity and long-term wealth by polishing your rough edges with personal growth. From NFL defensive back to pastor, Miles McPherson shares his journey to God and how to honor one another every day. What’s the connection between service and purpose? According to Brian Buffini, one stems from the other. Brian Buffini shares how to live an on-purpose life in this episode, recorded live at MasterMind Summit®. In this Take Over Tuesday episode, retail and business expert Mason Ludlow shares how play and a commitment to serving others lead to success in business. Brian Buffini shares timeless tips for cultivating resiliency every day until you achieve success. Walter Bond, former NBA star and popular presenter, discusses how the right mindset and relationships lead you to success. Ken Coleman, leadership expert and host of the EntreLeadership Podcast, shares tips for finding your sweet spot in business. Are your thoughts holding you back? Brian Buffini shares how to develop the personal and business philosophies that are crucial for success. Brian Buffini tackles the #1 impediment to success—self-doubt—and offers strategies for improving your beliefs about yourself, your abilities and your future. Financial expert David Bach answers questions from the audience of “The Peak Experience” and shares his tips for building wealth. Joe Niego walks listeners through the seven phases of achieving goals and offers tips to make your life-enhancing goals a reality. Renowned expert in human behavior, Pete Leddy, delves into the psychology of success and shares advice for thriving in business today. Diana Nightingale, wife of the personal development legend, Earl Nightingale, discusses Earl’s message and why it’s so important today. Best-selling author and leadership expert, Jon Gordon, shares tips on how to cultivate positivity in business and in life. Stand out from the competition by tapping into and improving your emotional intelligence and becoming more socially savvy. Successful CEO of NuVasive, Greg Lucier shares his advice and strategies for achieving success and cultivating leadership qualities. The three strategies new and experienced entrepreneurs should follow to build a thriving business from scratch. Brian Buffini shares the 10 principles of oil industry tycoon and philanthropist, John D. Rockefeller and explains how they apply today. To celebrate the 100th episode of The Brian Buffini Show, producer David Lally shares the top takeaways from five past episodes. Unmarketing expert and best-selling author Scott Stratten shares tips for creating an engaged community of advocates using timeless principles. Staying motivated involves hard work every day. Brian Buffini shares how to maintain your motivation, no matter what life throws at you. Brian Buffini delves into “The Richest Man in Babylon” by George Clason, the book whose lessons helped him achieve wealth. A personal note only takes a minute to write, but its impact is powerful. When written consistently, personal notes may be the secret to lasting success. In this Take-Over Tuesday, Buffini & Company Vice President of Coaching, Dave McGhee gives the scoop in coaching and how a coach can help you achieve greater success in your business. Brian Buffini shares 10 affirmations from Og Mandino’s bestselling book, The Greatest Salesman in the World. Kevin Buffini delves into the most common sales and communication styles and offers tips to help build relationships with the people in your life. Brian Buffini offers timeless tips to help you leverage the fundamentals and build a lasting business. Brian Buffini outlines the three biggest threats to success and offers tips to avoid them. The first female F-14 Tomcat pilot, Carey Lohrenz shares her journey to the cockpit and offers tips to help you achieve success in the face of adversity. Surprise your clients with the unexpected extras. Brian Buffini shares what they are and offers tips to help you incorporate them into your business. Brian Buffini shares the key to building a lasting, successful small business. The female Jerry McGuire” Molly Fletcher shares how building strong relationships and helping others allowed her achieve her dream of becoming a successful sports agent. Dynamic Buffini & Company speaker J’aime Nowak shares her successes and heartbreaks on her journey to becoming a top producing real estate professional and presenter. Brian Buffini outlines three tips to help you launch your most successful year. What is the power of a dream? Brian Buffini examines this question and provides tips to turn our dreams into reality. Brian Buffini outlines the timeless wisdom of three personal development greats: Earl Nightingale, Maxwell Maltz and Dorothea Brande. Brian Buffini delves into the ultimate lesson of the movie It’s a Wonderful Life and offers tips to adapt it into every day life. In this Takeover Tuesday, neurosurgeon and best-selling author, Dr. David Levy explains how to manage stress, especially in our fast-paced, tech-driven society. Beverly Buffini shares her six timeless principles for creating and living a wonderful life. Brian Buffini delves further into Oz Dynamic and shares strategies for developing your own heroic characteristics. Brian Buffini explains the Oz Dynamic and shares how to tap into the strengths of Dorothy, the Scarecrow, the Tin man and the Lion. Best-selling author, speaker and entrepreneur Mike Foster shares why self-care is important in leadership and in life. Brian Buffini shares the lessons and timeless principles of a book that has greatly influenced him, “Acres of Diamonds” by Russell Conwell and explains how to apply them today. Olympic track star Joetta Clark Diggs shares her journey to the Olympics four times and beyond. Producer David Lally interviews Dermot Buffini about how a love for sales and service ultimately led him to the helm of North America’s largest coaching company. Best-selling author and nutritional expert, Joel Fuhrman, M.D. explains how nutrient-dense foods help heal the body and can prevent diseases such as heart disease, diabetes and even cancer. Olympian and philanthropist Scott Hamilton shares his story, from his journey to the Olympics to how skating provided the foundation for life. Tom Ziglar, son of the legendary motivational speaker Zig Ziglar, discusses his father, grief and the daily habits that are essential for success. Best-selling author Mitch Albom shares his story, from his start as a struggling sports writer to building a career sharing the human stories of sports underdogs. In part two, success expert and best-selling author Brian Tracy shares why habits are so critical to success. Personal development expert and best-selling author Brian Tracy shares his three top tips for achieving success and becoming a millionaire. Brian Buffini shares how to put the seven success traits into practice by combining your thoughts with your actions. Brian Buffini shares the seven traits of successful emigrants who have made it big in America. Brian Buffini shares why the American Dream is alive and well in America and offers tips to attain it. Dr. Ivan Misner, founder of BNI and the “Father of Modern Networking” shares his tips for connecting in our tech-driven world. Organization expert, Dr. Alex Lackey offers five tips to become better organized and become more efficient and productive. Darren Hardy shares his tips for thriving as a leader in our changing times. Dermot Buffini interviews Instagram engineer Shayne Sweeney about finding one’s passion and his journey to success. Brian Buffini hosts a panel of financial and real estate experts to share timeless wealth-building tips. Best-selling author and tech pioneer, Tim Sanders, discusses how sharing your knowledge, network and compassion can lead to success. Anna Buffini, top-ranked equestrian and Brian’s daughter, delves into the making of a champion. Best-selling author, David Bach, offers timeless tips for taking control of your financial future. Brian Buffini delves into the concept of change and outlines tips to help listeners make positive, lasting change. Best-selling author, Jon Gordon, shares his tips for positive leadership. David Lally, producer of the Brian Buffini Show, puts Brian in the hot seat with your questions. America’s personal finance guru shares the secrets to building long-term wealth. Bestselling author, speaker and all-around inspiration, Andy Andrews shares raw and grounded wisdom on how to win at the little things so you can win in life. Darren Hardy's dogged and inspiring climb to the top to become the driving force behind SUCCESS magazine, a best-selling author, a much sought-after speaker, and general all-round renaissance man! One of the world's greatest mountaineers – Alison Levine – shares how to keep going no matter what. From serving burgers to serving as CEO of Warren Buffett’s real estate franchise. In the quest for happiness it’s easy to end up disappointed, but when you learn how to align your values with your actions you can achieve what matters most. Best-selling author Shad Helmstetter explains how to reprogram negative self-talk in order to achieve success. It’s been said that Dave Liniger is the greatest franchisor since Ray Kroc. Founder and CEO of RE/MAX – the world’s most successful real estate company – and member of the International Franchise Hall of Fame, Dave gives a rare behind-the-scenes interview to Dermot Buffini, CEO of Buffini & Company. NFL star, Justin Forsett shares his journey from poverty to professional football and explains the importance of service. In honor of Valentine’s Day, Brian Buffini offers tips to help you love your life. Brian Buffini delves into the one decision that can help you build a fortune. Diana Nyad shares her inspirational story of achieving success after failure and why you should never give up on your dreams. Brian Buffini outlines the three essentials of having a coach and explains why everyone needs one. Brian Buffini explains why rest is vital to lasting success and offers tips to incorporate it into your business. Brian Buffini interviews Dermot Buffini, CEO of the largest coaching and training organization in the US. Brian Buffini outlines why it’s important to reflect, reorganize and reload at the end of the year. Brian Buffini breaks down the myths and misconceptions about happiness and offers tips to help you achieve happiness in 2017. Brian Buffini welcomes special guest, Joe Niego, who outlines tips for developing good character, one choice at a time. In the spirit of season, Brian Buffini outlines the benefits of gratitude and why it’s an attitude of the heart. In one of his favorite interviews, Brian Buffini explored how to improve listening skills with communication expert Steve Shapiro. Get motivated to succeed by making up your mind to win. Brian Buffini offers the tips and strategies you need to win in 2017 and beyond. Are you living an inspired life? Brian Buffini shares the benefits of leading an inspired life and provides the tools to make it a reality. Entrepreneur and “car guy” Alan Taylor shares his tips for success and why honesty matters. Are you living an inspired life? Brian Buffini shares the benefits of leading an inspired life and offers the tools that can make it a reality. Andy Andrews shares his inspiring story and offers memorable lessons in maintaining perspective. Brian Buffini shares his tips to find a mentor, be mentored and become a mentor to others. Brian and Beverly Buffini share tips on what’s worked well for them raising kids in today’s world. Brian and Beverly Buffini share their tips for a happy and long-lasting relationship. What’s it like to walk on the moon? Brian shares his interview with Neil Armstrong and gains insight into one of America’s most famous astronauts. Brian interviews world-renowned psychologist, Daniel Goleman, and learns more about the connection between emotional intelligence and great leadership. Brian shares his strategies for moving through the financial sequence, from stability to significance. Tom Ziglar picks up where his father left off, offering motivational tips to help you build great habits and succeed. What started as an appointment to find a family pet turned into a story Brian and his wife will never forget, and still laugh about 15 years later. Success relies on more than putting in the work, it’s also important to figure out how to manage the world’s most difficult person—yourself. What was supposed to be a relaxing week bonding with his then-teenaged son turned into a challenging climb up one of the tallest glaciers in Canada…and a chance for Brian to reconnect with his “why? More than 50% of small businesses fail in five years; yours doesn’t have to be one of them. In this episode, Brian shares seven timeless tips for building an unstoppable business that apply to all industries. If you want to stand out in the market, it’s essential to differentiate yourself and show how you add value to your clients and solve their problems. In this episode, Brian Buffini and branding expert Sally Hogshead delve into the most common personality traits and how people and brands can use their strengths to provide value and set themselves apart from their competition. Her new book Fascinate explores how to make your brand impossible to resist. Don’t miss this powerful interview and get your free assessment tool - just for tuning in. There are seven common traits of emigrants who came to this country with nothing and built a successful life…in this episode discover how to live the life you’ve always imagined by tapping into the potential you’ve always had. In this motivational interview from MasterMind Summit™, Brian interviews Lou Holtz. This master coach teaches you how to turn your goals and dreams in to reality. He gives you tips and tricks to stay motivated and how to be the best at what you do! Brian Buffini digs into the archives of Buffini & Company’s MasterMind Summit® for this interview with his late, great mentors Jim Rohn and Zig Ziglar. Jim and Zig spent their lives philosophizing, training and inspiring business leaders to realize and achieve their full potential. In this interview, they share their wisdom, personal philosophies and advice for success. You’ll learn how philosophy influences everything around us, the main reason why everyone needs a wall of gratitude, the lasting impact of small continuous steps and why celebrating your achievements can motivate you to achieve more. Let Jim and Zig infuse your spirit with this motivational pick-me-up! John O’Leary has lived through worse than most can imagine. At the age of nine, John was severely burned on 100% of his body. No one expected him to survive the first night. But he did. He then survived months in a hospital bed, dozens of surgeries, and years of therapy. Before his tenth birthday, John lost all of his fingers to amputation. There are commonalities to success – in all walks of life. Brian will explore those traits and how you can develop the attitude of a winner each and every day! This introduction to “The Brian Buffini Show” will explore the mindset, motivation and methodology we all need to be successful.